I was born in a quaint seaside community on the west coast of Florida. As a lifelong Florida native, every time I visit the beautiful beaches of my home state I feel nostalgic about the white sand, sea life and beckoning waters. Therefore, I was immediately captivated by the stunning jewelry collection, Sealife by Congress™ by Congress Jewelry. This gorgeous jewelry collection is handcrafted by the designer on beautiful Sanibel Island, Florida and has offerings featuring dolphins, sand dollars, palm trees, shells and a variety of other marine life. 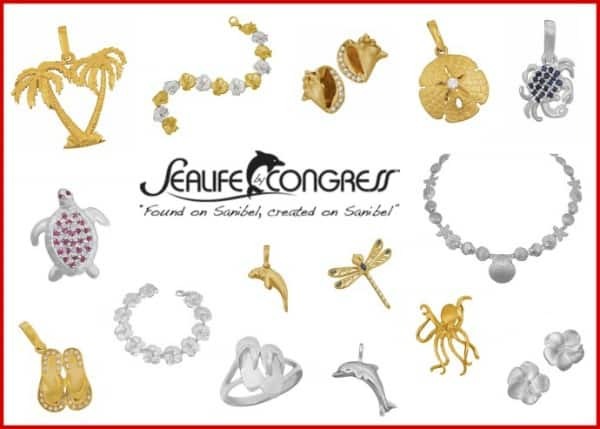 You can choose your perfect piece of jewelry to represent your favorite Florida memories or sea life from among the wide selection of pendants, rings, bracelets and earrings at Sealife by Congress™! You can also feel confident that your piece from this collection will be made using only the finest materials such as sterling silver and 14k gold. What makes each piece of handcrafted jewelry from Sealife by Congress™ so extraordinary is that the details are exquisite….it is apparent that the designer is passionate about the craft and the subject matter. When I first browsed this collection, there were numerous pieces that immediately reminded me of my years living on the gulf coast combing the beaches, boating and diving. 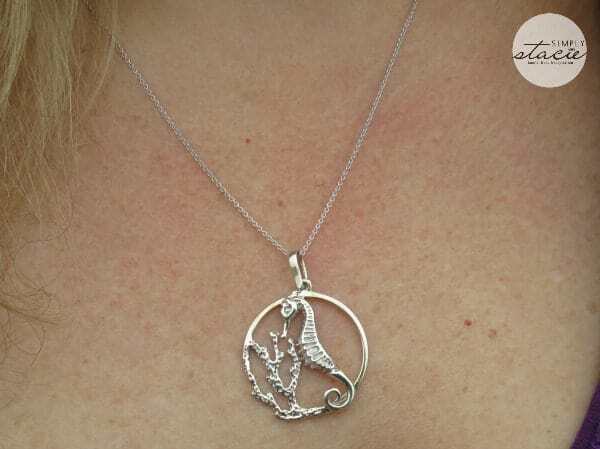 I have fallen head over heels for the Seahorse, Starfish & Sanddollar Reef Pendant (SRP $100) which is beautifully crafted from sterling silver. As a diver, it perfectly captures my first memories observing a seahorse swimming along a reef off the coast of Florida and the starfish and sand dollar represents two of my favorite real-life adventures as a child exploring the beaches and coming across these amazing creatures. I am very pleased with the quality and craftsmanship of this piece and will proudly wear it especially on upcoming visits to the beach. There are so many lovely pieces of jewelry available at Sealife by Congress™ and a few of my favorites include the 14k Yellow Gold Scallop Pendant (SRP $280) which would be the perfect gift for my sister who eagerly awaits scalloping season every summer and the Sterling Silver Manatee Earrings (SRP $80). I appreciate that there is a wide range of prices in the collection with nice pieces available for around $100 or less. There are also pieces available at a higher price point such as the breath-taking 14k Yellow Gold Dolphin Bracelet (SRP $1,605) and the 14k Yellow Gold Large Heron Pendant (SRP $370). If you or someone you know is having a beach wedding coming up then you will definitely want to wear a piece from this collection. 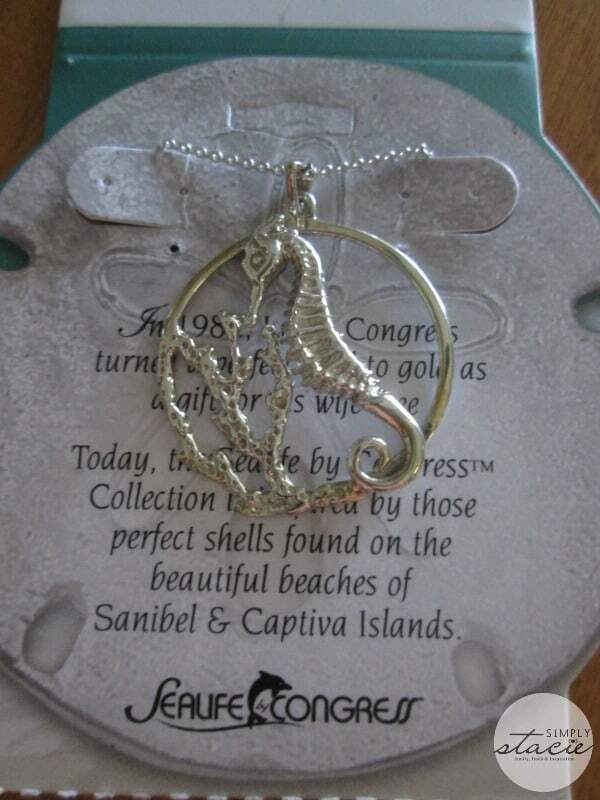 The Sealife by Congress jewelry collection is a wonderful way to enhance your favorite memories of the seashore and would make a memorable gift idea that is sure to become a lifelong treasure for the lucky recipient. You are invited to visit the Sealife by Congress™ website to browse the entire collection of nature inspired jewelry and purchase your favorite. Which piece of jewelry will be the most memorable for you or your loved one? I like the STERLING SILVER ANGEL FISH PENDANT. I would have a difficult time choosing just one. We were on Sanibel last summer and I came home with the flip flop pendant which I dearly love. My gf would love the gold gecko earrings, those are really neat! The sand dollar bracelet is cute. I love the Sterling Silver Small Turtle Pendant. My favorite piece of jewelry in the collection is the 14K White Gold 4 Turtle Band. I love the 14k Yellow Gold Small Gecko Earrings. I am tony l smoaks on rafflecopter. I love the yellow gold sealife bracelets, especially the sanddollar one. If I could pick anything from their site I would like to have 14 ct. gold medium crab pendant with diamond All of my kids were born in July which cancer the crab is their zodiac sign. I am a beach girl! Flip flops, star fish, sea horses, I love them all!!! I love the seahorse pendant! My daughter would love it as seahorses are her favorite! So many things to choose from but love sand dollars. My favorite is the 14K yellow gold large limpet shell pendant. We always have a contest at the beach to see who can find the most limpet shells. 14k Yellow Gold Mini Lighthouse Euro Earrings they are pretty. Loving all things nautical, I cant pick just one! There are a few sand dollar pendants that are very nice! 14k Yellow Gold Seahorse, Starfish & Sanddollar Pendant. I love the 14k Yellow Gold Grande Sealife Bracelet. I love the shells with the stones on the border…. It would go freat with the treasure chest that I recently obtained in my family tree; to bad the chest is empty but with the shells it’ll enlighten the treasure found on every beach – besides the gold sinking into the waters – also known as – the sunset! I like the 14k Yellow Gold Wide 3 Sanddollar Ring. This is so pretty in silver. I’ve rarely had the chance to go to the beach, but when I did I so enjoyed the feel of the warm sand in between my toes!